As you can see different values for measure “amount” occur for “Alice” and “Hans”. What is the reason? In the left query all fields are coming from the left table and, based on the cardinality setting, join pruning can occur. Therefore, the join is not executed and in consequence the multiple matching entries for “Alice” in the right table (compare content of the tables shown here) are not found. 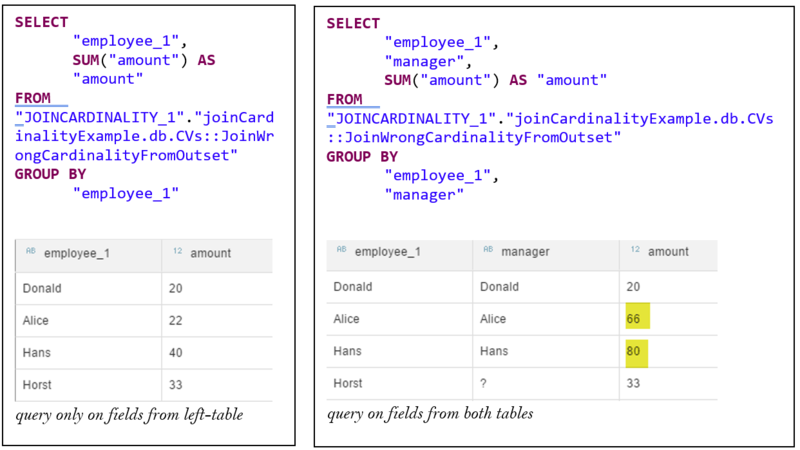 In the query on the right side a join is forced by querying also “manager” from the right table. Here, join execution leads to trippling of the record for “Alice” in the left table and the result is 3*22=66 for field “amount”. Similarly for Hans: Hans has two matching entries in the right table (Hans has two employees) and therefore measure “amount” results in 2*20=40. Nothing is wrong here with the optimizer but with the setting of the cardinality that does not match the data. In the current example, cardinality had been set wrongly from the beginning. In contrast in the following examples situations will be described that can lead to wrong cardinality settings even though the settings are correct at the beginning. The first example starts with a model that produces the same values of “amount” irrespective of whether join pruning occurs or not. After adding an additional field with a “keep flag” the “amount” for “Alice” and “Hans” will change depending on whether join pruning occurs or not. 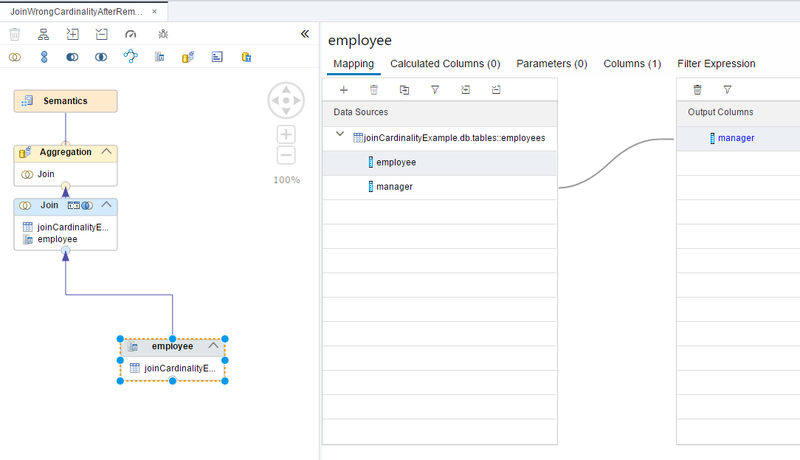 When only field “manager” is mapped in the aggregation node multiple values of the same “manager” will be condensed into one value by the aggregation node. Run the two SQL statements below. The first one allows join pruning to occur as it only requests fields from the left side, the second one prevents join pruning by selecting also field “manager” from the right table. You see the same values for “amount” independent of whether or not join pruning occurs. The reason is that the aggregation on the join field “manager” will make sure that only distinct values enter the join from the right side. Your cardinality setting of “1..1” is correct. 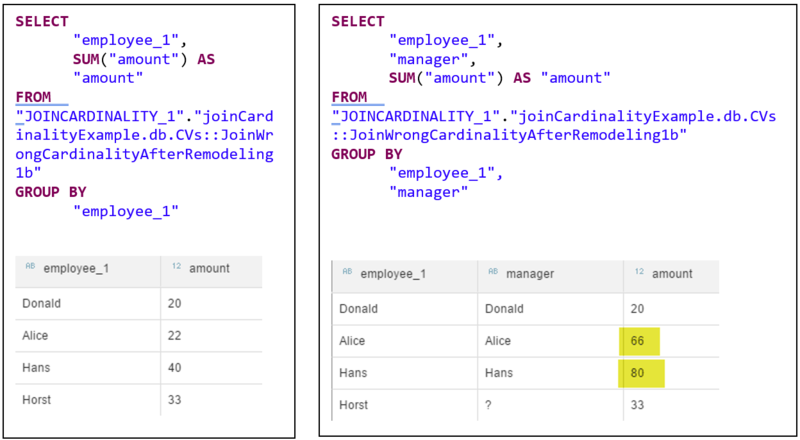 This means that a change to your model (adding another field) below your join node might make your right table entries no longer unique when arriving at the join node which violates the cardinality setting. The consequences are that the values for “amount” depend on whether join pruning occurs or not. Changing the aggregation to a projection means that “manager” no longer provides only distinct values to the join. As you can see, now join pruning has an influence on the resulting values of measure “amount”. 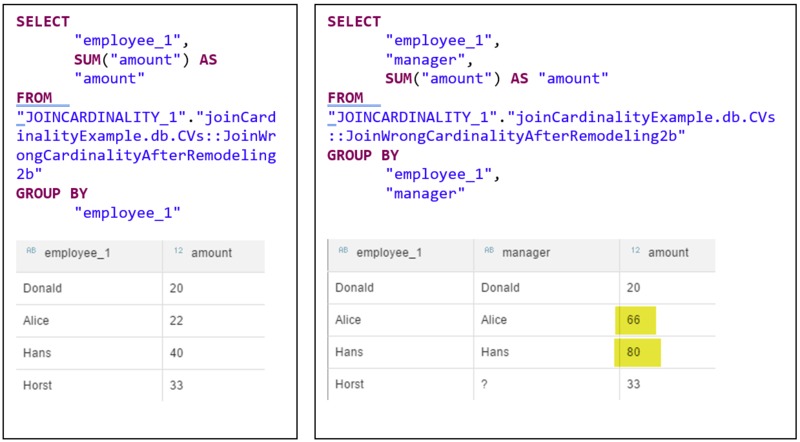 To recap, model changes below your join node (this time a switch of an aggregation to a projection) may lead to a violation of your join cardinality setting. 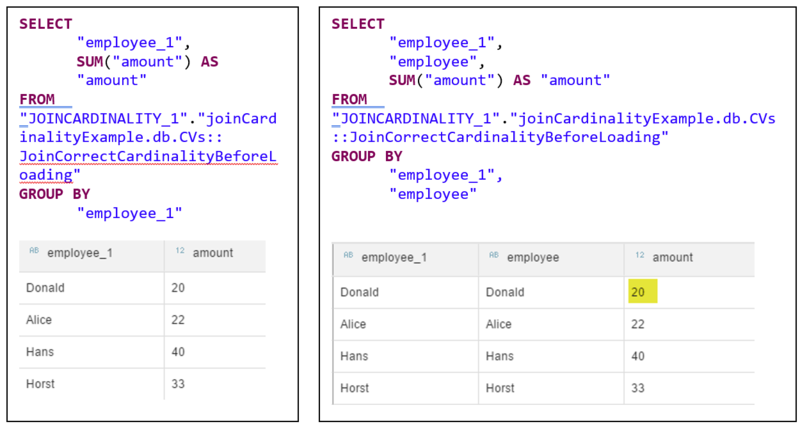 The join is defined on “employee” and the cardinality reflects the true data cardinality of “1..1”. We will query “employee” in addition from the right table to check the impact of join pruning. Not surprisingly with the correct cardinality setting the same values for “amount” are returned independent of whether join pruning occurs or not. The “amount” of “Donald” varies depending on whether the join is executed or not. This is a consequence of the cardinality setting which had been true at the beginning but became wrong after additional data had been loaded. SAP Note 2737941 can help you in detecting wrong join cardinality settings based on the current data. However, after additional loading of data the check would have to re-run. 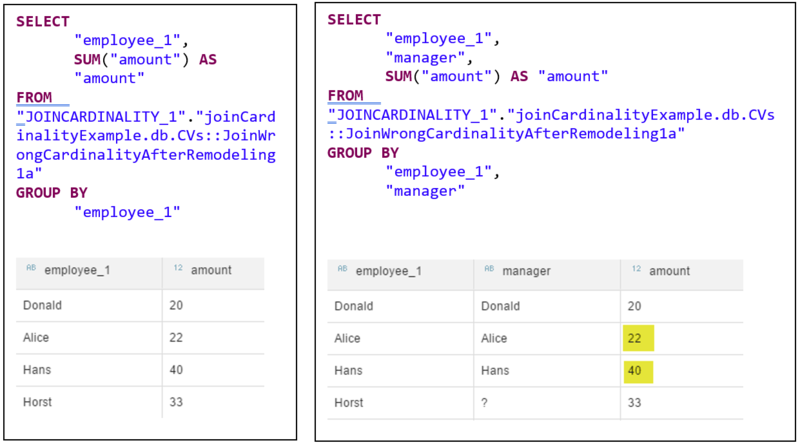 In the very first example, cardinality is set as wrong which is true, but the join pruning didn’t occur as we requested manager field from right table. The results of amount column depend on the values returned by the join condition itself. How did the wrong cardinality affect the amount values? Here “manager” is requested from the right table. This means join pruning cannot occur and the join has to be executed. When the join is executed e.g., “Alice” is found three times on the right table which means the amount from the left table of 22 is replicated three times. I do understand the reason behind the populated amount values. And this is because of the join execution. So, how did the wrong cardinality setting affect the results, because it is indeed the join execution? 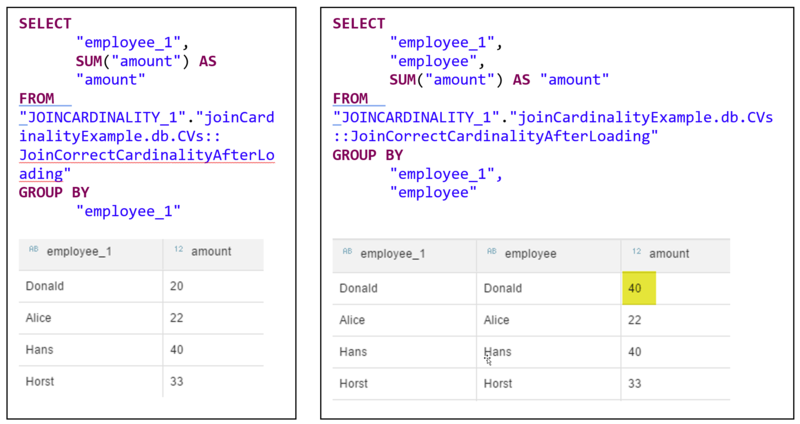 If the join cardinality was not set wrongly but let’s say 1:n the optimizer would have known that the join cannot be pruned and therefore the join would have been executed. This is also described in the following post . The current page is only a subpage of this topic.